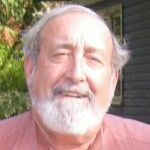 At the start of the 21st century, Chileans were in the process of recovering their government and their collective sanity after way too many years of internal struggle, but there was a feeling that they were moving too rapidly and too completely away from the customs and principles that had bound them together for so long. They were abandoning their traditions, their traditional cuisine, their music, and their national dance, the cueca. 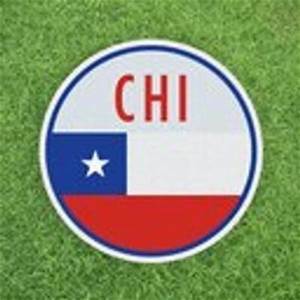 To help reverse this trend, they established the “Semana de la Chilenidad”, to be held in September each year around the “18”, to at least for a week focus Chileans on their heritage. And since then, during the “Semana de la Chilenidad”, they have had their children take cueca classes, learn the words and music to their most traditional songs, read books about Chilean history, recite poems written by one of Chile’s favorite poets and educator Gabriela Mistral, draw pictures of the Chilean flag and their hero Bernardo O’Higgins, and in general focus their attention on Chilean traditions. 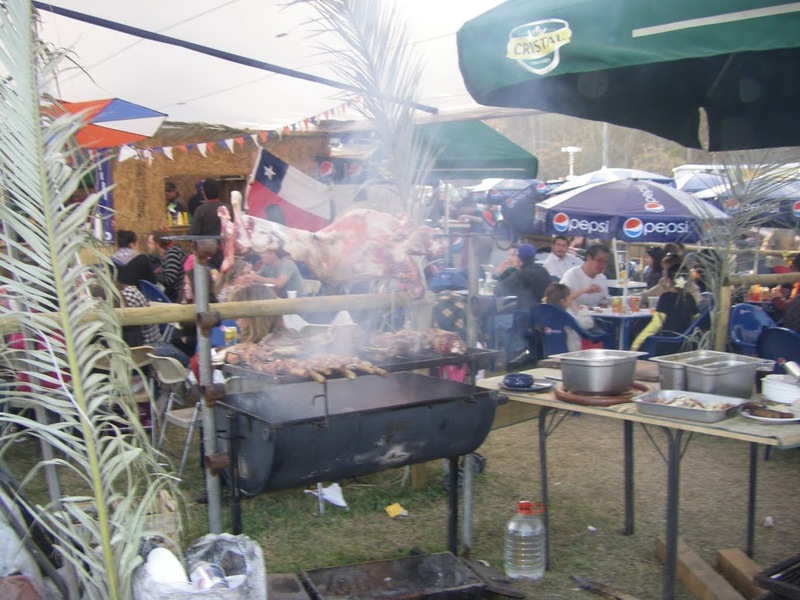 One of those traditions Chileans are intent on saving, one that is front and center during the “18” celebration, is the asado. Chileans, like their neighbors to the east, the Argentines, are mostly carnivores. 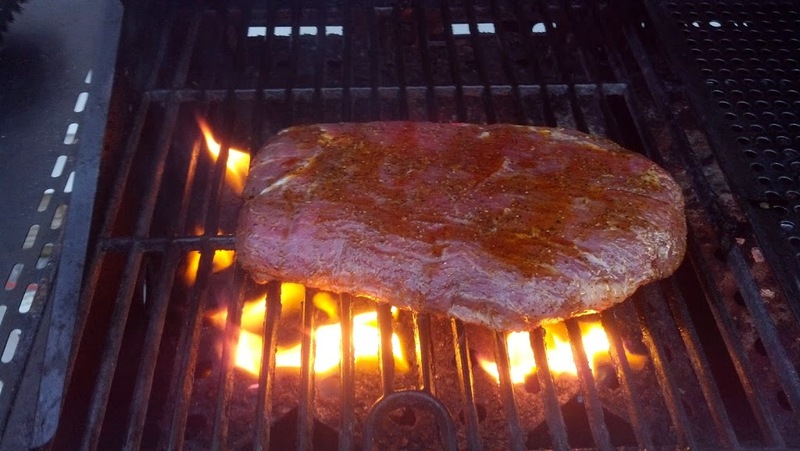 Beef, pork, and lamb are the mainstays. At a Chilean asado, vegetarians are served chicken! 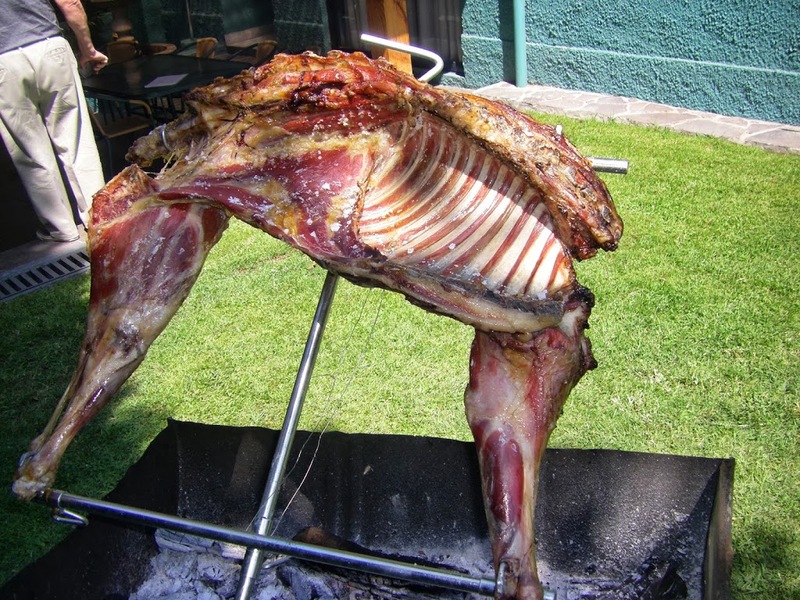 In the countryside, especially in the rural south, they prepare asado al palo, which is a whole or half lamb skewered on a long eucalyptus pole, slow-roasted over hot coals. Delicious. Various cuts of beef, from filete (tenderloin), to palanca (flank), to lomo liso & lomo vetado (sirloin), and other sundry lower-cost cuts that would remind you of U.S. chuck steak, are usually simply grilled over charcoal. Lamb chops, chicken legs, pork chops and pork loin are grilled and served as snacks, finger food, and are all washed down with corpulent Cabernet sauvignon or the more recently popular Carmenere, as you wait for the main course, the grilled beef. Ximena and I spent the Bicentennial holidays in and around Santiago. 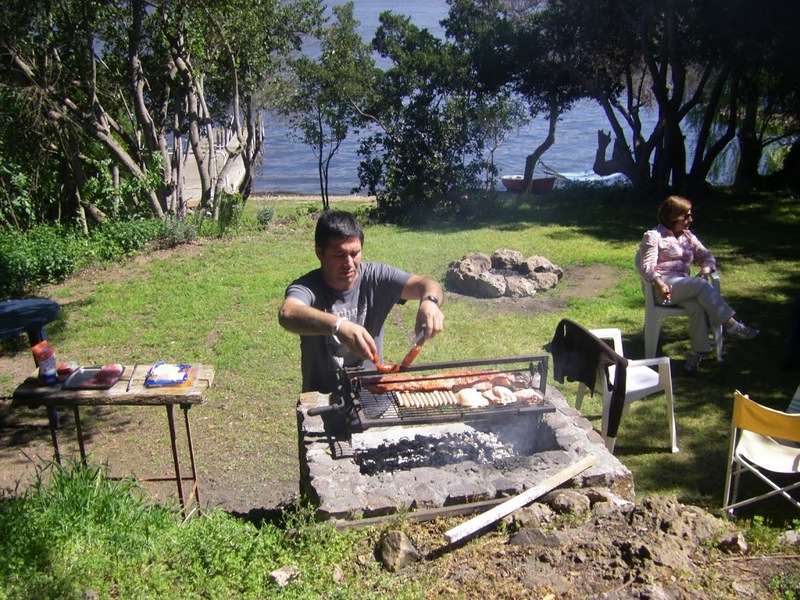 Each day, an asado was on the schedule. 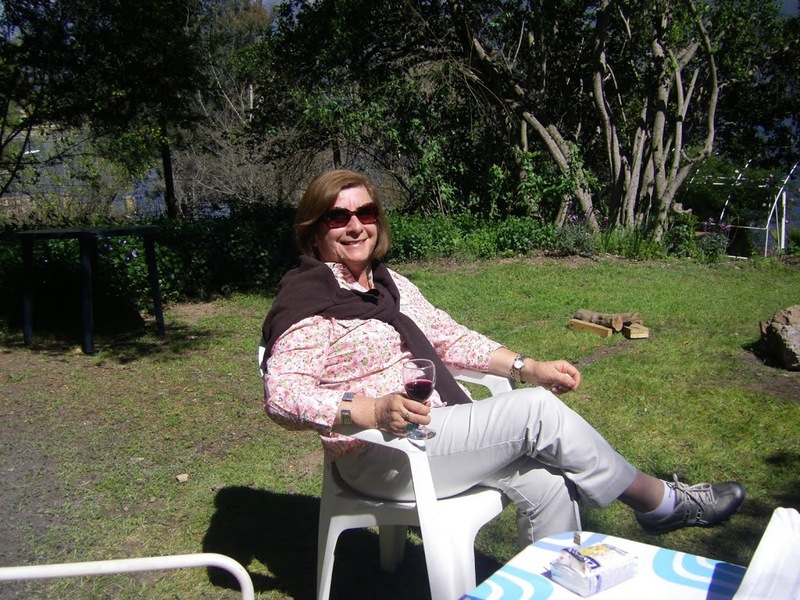 One day we spent at an asado on the outskirts of Santiago, at the home of a wonderful woman who was the Peace Corps secretary when I worked on the staff there from 1976-79, Patricia, her husband Mario, and family. Another day we drove to a lovely lakeside retreat at Laguna Aculeo, an hour outside of Santiago, for another asado with Ximena’s nephew, Carlos, and his family. 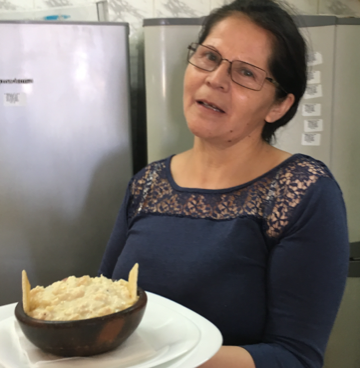 On the “18”, we lunched on two traditional favorites, pastel de choclo and ensalada Chilena at home with Ximena’s mother, Ana Luisa, and sister, Mari Paz, and then visited the fondas at a huge park nearby. There were horse shows in the arena, cueca dancing throughout on small wooden platforms, kite flying in the adjoining fields, juegos criollos (traditional games) like taka taka, rana and rayuela for the kids, and folklore concerts throughout ( Los Jaivas, Huasos de Algarrobal, Los Huasos Quincheros, Los Cuatro Cuartos). To top it off, on the final day of the 4-day celebration we joined Ximena’s cousin Pablo, his vivacious wife Paula and their lovely family for, what else, an asado. Pablo is a master at the grill, and besides the sausages (chorizo and longaniza), chicken (for my “vegetarian” sister-in-law), and of course grilled prime cut lomo, Pablo always throws a few prietas on the grill. These blood sausages, typical at most asados in Argentina and Chile, when grilled to perfection, as they were the day we were at Pablo’s home, simply melt in your mouth, especially with Chilean tinto to help. The ubiquitous empanada, especially the oven-baked one filled with pino (mixture of diced beef, chopped onion, black olive, piece of hard boiled egg, flavored with cumin) is one of the classic “18” foods. Another is Chilean sausage, either the chorizo or the longaniza, both mostly pork. The Chilean longaniza was made famous in the city of Chillan, 300 kilometers south of Santiago. 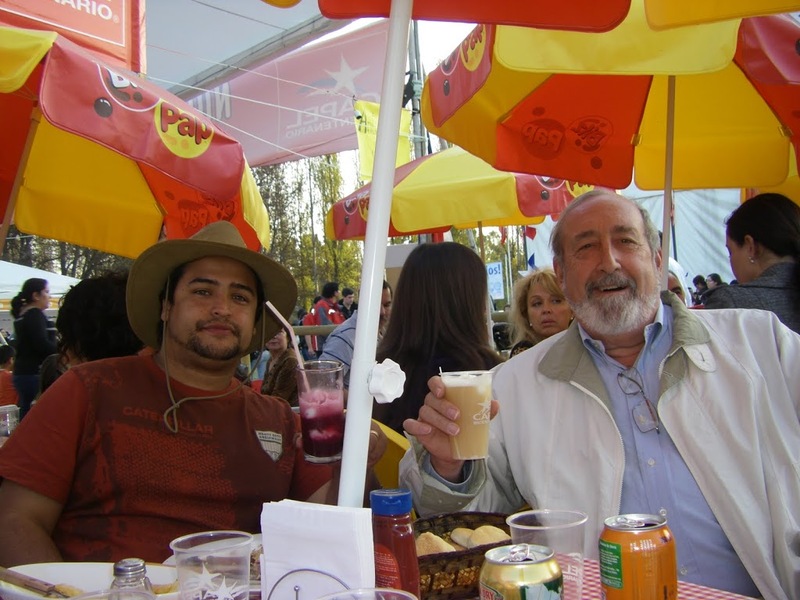 If a foreigner wants to impress Chileans with his knowledge of Chile, when the subject of longaniza comes up, and it always does around an asado, you have to quickly state before anyone else does, “Of course the best longaniza are the Los Pincheira brand”, and you’re in. Another custom especially important to adopt is to stand around the grill with other family and friends, pointing out to the host who is doing the grilling, what he is doing wrong, how he is turning the meat too often or not often enough, that the meat needs some olive oil to keep it moist, or better yet, beer sprayed on it, etc. 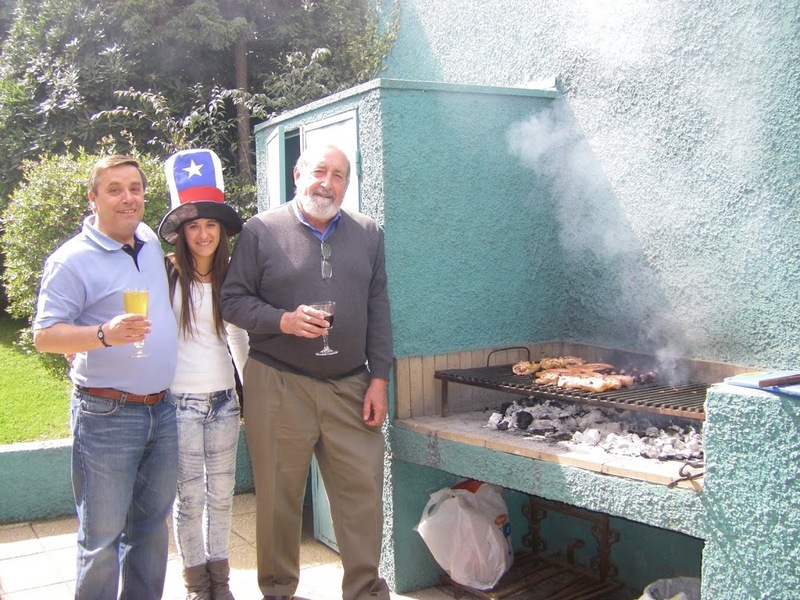 Apparently Chilean grillers need lots of advice on how to grill, because at every asado I have ever attended the grill is surrounded by many experts on grilling willing to share their knowledge of “the right way” to do an asado. 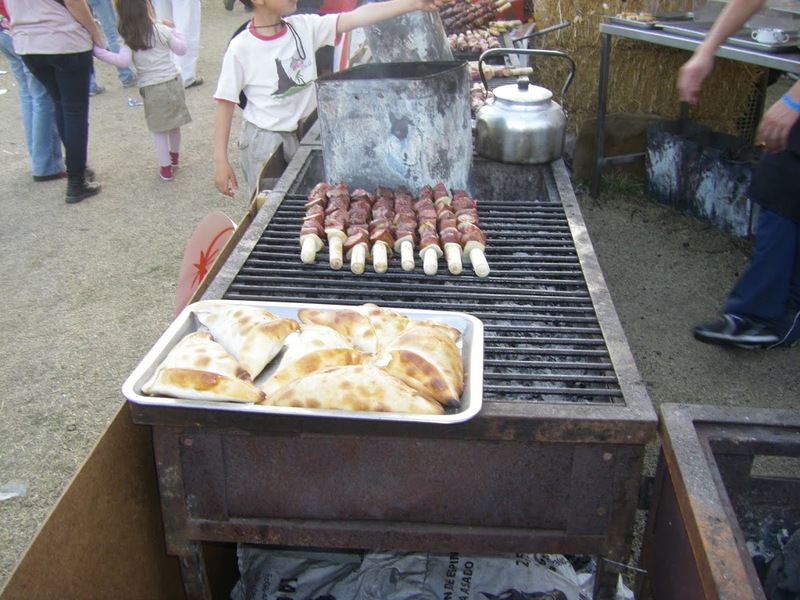 Chileans have picked up the Argentine habit of snacking, prior to the main course, on choripan, which is a grilled chorizo, sizzling hot off the grill, wrapped in a crispy roll and seasoned further with dark red salsa de aji made from roasted cacho de cabra peppers ground up with a bit of olive oil. Or you may also be served pebre, a moist green mixture of cilantro, onion, and oil, similar to Argentine chimichurri, used to season meat. Of course no Chilean asado is complete without ensalada Chilena, a salad of feathered onions (slightly scalded in hot water to tame the taste a bit), fresh tomatoes, oil, and topped with parsley. 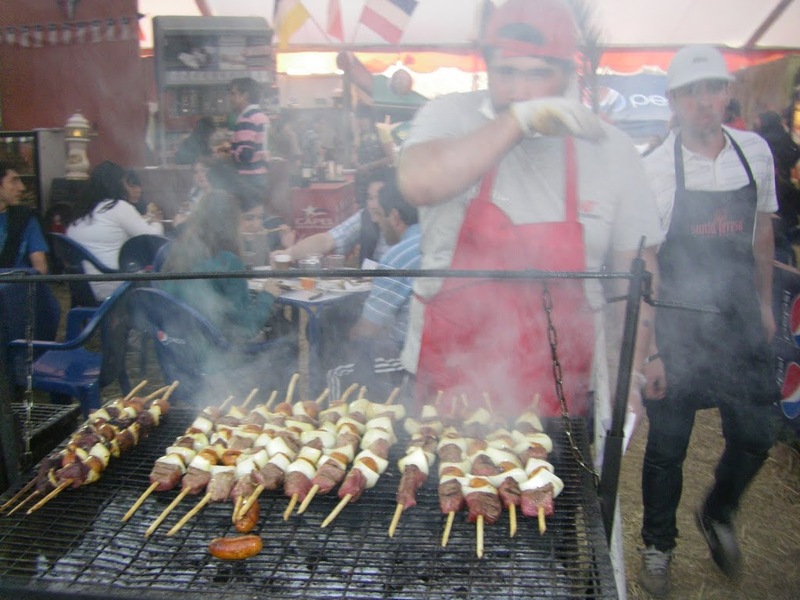 But the real champion of the Chilean “18” cuisine is the anticucho. The “anticucho comes out of hiding for the national holiday. 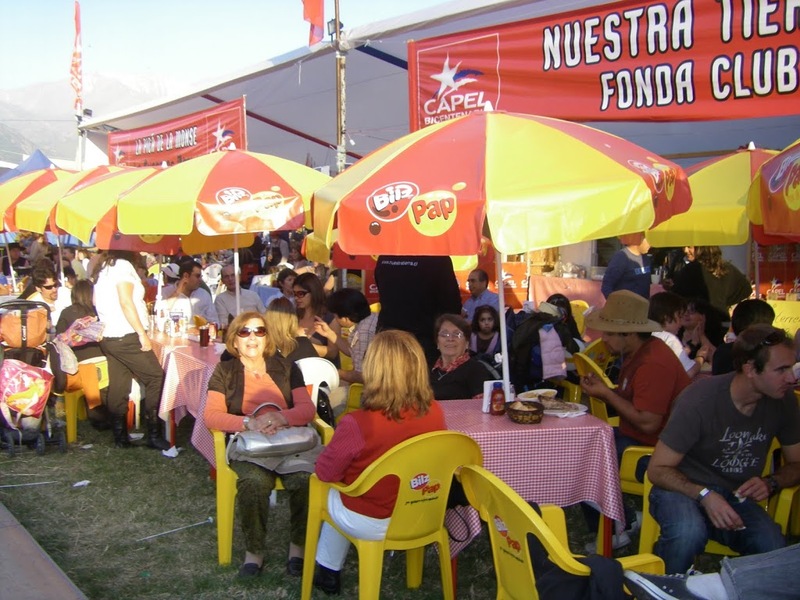 Throughout the rest of the year you may find one at the occasional Saturday afternoon family picnic, but for the most part Chileans reserve the anticucho for the “18 de Septiembre” celebration. This “18” mainstay is like a shish kabob, a skewer with chunks of meat, roasted over an open fire. 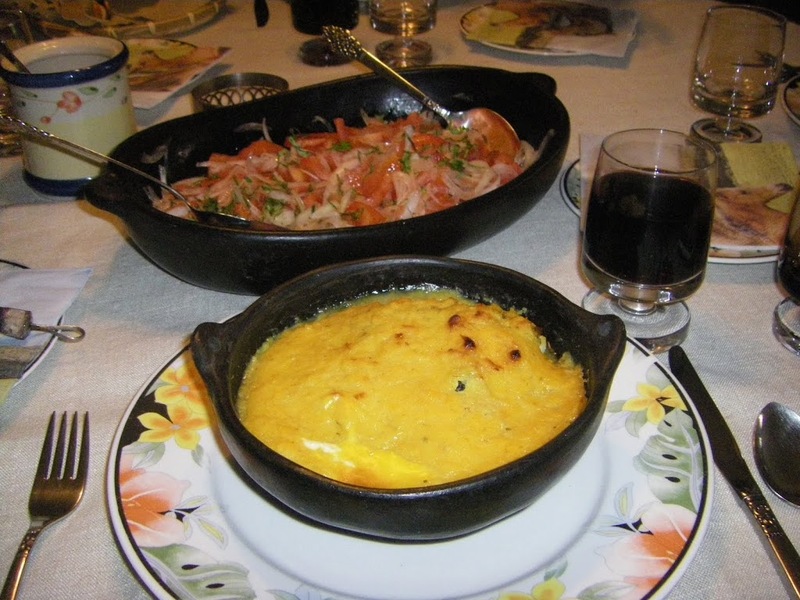 It has its origins in the colonial period, probably brought from Peru, like so many other foods and drink (much to Chileans’ chagrin). There are many kinds of anticuchos, including the truest but these days the scarcest one, made with beef heart. Most common are pork and beef, sometimes mixed with chicken (for the vegetarians), longaniza, chorizo, vienesas (Chilean hot dogs), mushrooms, onion, and red and green sweet pepper. As these skewers are grilled, they splash a mixture of garlic, cilantro, salt, lemon, vinegar, or even beer on them with a parsley sprig to keep them moist and flavorful. It is recorded that in 2004, in the town of Quilicura near Santiago, they produced the world’s longest anticucho. It was said to be 200 meters long, contained 400 kilos of meat, and 5,000 slices of onion and red sweet pepper. I could not find information on how many people it took to eat the thing, or even that they actually ate it. But I’m quite sure they did. At the fondas we visited on the “18” in Santiago this year, every food stand was serving anticuchos. I have not seen so many anticuchos in one place, ever. And when you wash them down with a glass of terremoto the mixture of pipeno wine (which is the classic unfiltered fresh wine from the country that huasos like Claudio my father-in-law were raised on), pineapple ice cream, and Fernet Branca, you have no choice but to join in with the rest of Chile and exclaim, Viva Chile!!…. Viva el 18 de Septiember!!!. Written in Leesburg, Virginia on October 30, 2010.